Khawaja, Cummins and Patterson will play this match for the Thunder. The penultimate league stage game in BBL 2018-19 will be played between the Sydney Thunder. With a miraculous win in their last game, the Brisbane Heat have almost taken the Thunder out of the semi-final equation. It is almost impossible for the ‘Men in Green’ to go past the NRR of Heat from the position where they are placed now. Therefore, this game is more or less a dead rubber unless there is a marvel that is on the cards for the Sydney franchise. The Hobart Hurricanes, on the other hand, booked their berth in the knockouts. They will possibly treat this game to be a good practice match before the first semi-final that will take place on 14 February 2019. The 55th match of the Big Bash League (BBL) 2018-19 will be played between Sydney Thunder and Hobart Hurricanes at the Manuka Oval in Canberra. The match starts at 6:15 PM local time (7:15 AM GMT) (12:45 PM IST). The game will be live on Sony SIX and Sony SIX HD in India. Live streaming is available on Sony Liv. The Manuka Oval in Canberra is true to the stroke-makers and often witnesses high-scoring games. This match, as well, could be a run feast and the Hobart batsmen will enjoy playing on a surface such as this. 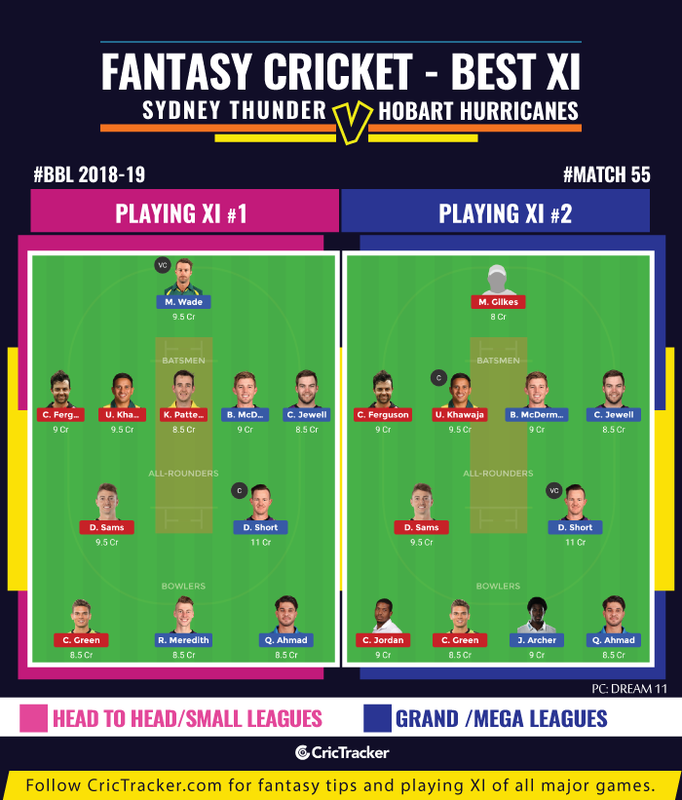 Shane Watson (C), Usman Khawaja, Callum Ferguson, Kurtis Patterson/Gurinder Sandhu, Matt Gilkes (WK), Anton Devcich, Daniel Sams, Chris Green, Chris Jordan, Pat Cummins, Fawad Ahmed. 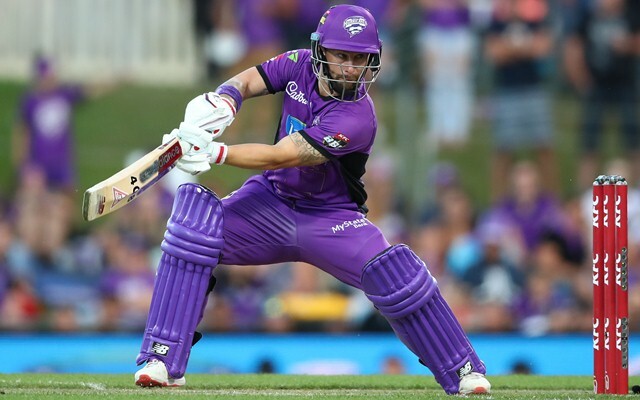 Matthew Wade (C & Wk), D’Arcy Short, Caleb Jewell, Ben McDermott, George Bailey, Simon Milenko, Qais Ahmed, David Moody, Jofra Archer, Riley Meredith, Clive Rose. No changes to the squad. Pat Cummins, Usman Khawaja, Kurtis Patterson join Sydney Thunder after the Test series against Sri Lanka. Usman Khawaja has got a terrific record in the BBL. He scored 956 runs from 24 matches at an average of 50.31 with two centuries and six fifties. With some valuable runs under his belt in the Test match against Sri Lanka, he’d a confident individual entering this game. D’Arcy Short is a must as captain or vice-captain. The other captaincy options are Matthew Wade, Usman Khawaja and Callum Ferguson. You can consider Daniel Sams, Ben McDermott and Shane Watson as the vice-captains for your side. Qais Ahmed, Jofra Archer and Anton Devcich are the players whom you can examine as multipliers. Bowlers – Chris Green, Riley Meredith, Qais Ahmed. Bowlers – Chris Jordan, Chris Green, Jofra Archer, Qais Ahmed. The Sydney Thunder are predicted to win the match.